Cornerstone Christian School celebrates the graduation of our first senior class, the class of 2015! We were honored to have these exceptional students featured in a news story for The Omaha World Herald. Congratulations to the Cornerstone Winterguard on their First place win at the Heartland Winter Arts Association Championships, Saturday March 22, 2014. The team competed against seven other schools in the Scholastic A division This year’s show was “Sakura” with music from Kung Fu Piano. The almost four minute routine included dance, sabre, rifle, and flag choreography. 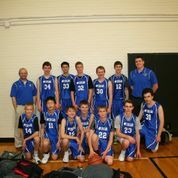 On March 1, 2014 the 7th – 8th grade boys’ basketball team won the Parochial Athletic League B Division Championship. Cornerstone defeated Boys Town, a team that the Cougars had lost to in their two previous engagements. It was a great game with a 15 point win! Coach Zanger is very proud of the way his young men persevered through the season and how each member of the team glorified God in the way they played basketball. Go Cougars!